Performing on August 8th: Laura and the Killed Men (update from poster above). Enjoy the coolness of these concerts on the modern Sun Link streetcar, which started operation a year ago on July 25, 2014. (Free all day on July 25, on their first anniversary next week). 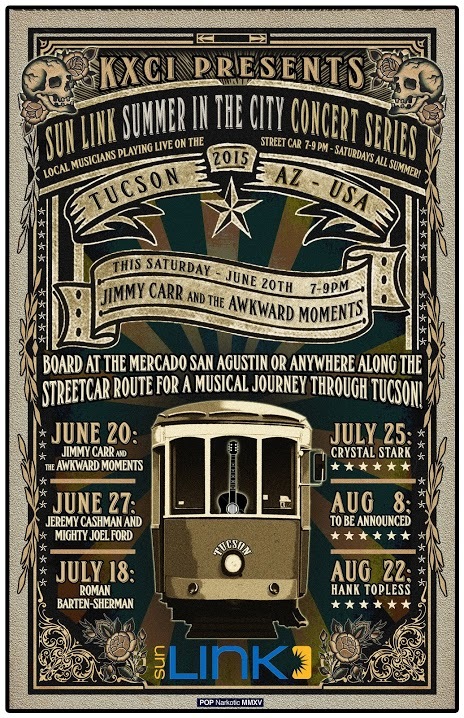 I jumped on board for the very first concert by Jimmy Car & the Awkward Moments back on June 20, with lots of other people, and it was a rocking good time! As the Sun Link streetcar nears its first anniversary, the KXCI Presents: Sun Link Summer in the City Concert Series continues with live concerts inside select streetcars. This Saturday, July 18, at 7 p.m. the young local blues artist, Roman Barten-Sherman will play. All passengers must have a valid SunGO card or ticket to board Sun Link and enjoy the concert. The fourth concert date in the series will take place Saturday, July 25, at 7 p.m., on Sun Link’s first anniversary with award-winning R&B/Jazz/Pop vocalist, Crystal Stark.